Yesterday after my swimming, I went to NorthPoint Mall to check out the running shorts and the shirt. I went their last Friday but I did not buy anything. I have decided to finally buy so I don't have any reasons not to run. 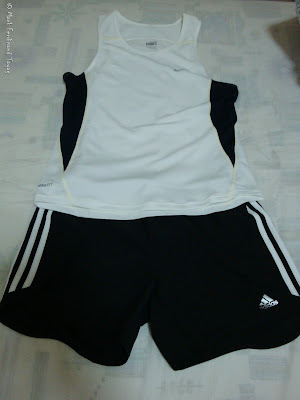 I was able to buy a Nike sleeveless shirt as well as the Adidas running shorts. All with a 10% discount. This morning, I woke up around 6 A.M. and wore my Nike and Adidas running outfit. By the way, I wore my old Adidas shoes that I think should retire already. I am thinking of buying a new one at the end of the month. I just hope I can find a pair of shoes that is less than S$69. Our block by the way is near the Yishun Park where the usual runners go. It was a cold morning but bearable. I have planned to just run for about one hour since I am just a newbie. My run was quite fine and I enjoy seeing the nature especially jogging in the forest trail. Maybe next time I can bring my camera to take some pictures. I hope to see the monkey next time. Right now, my legs are sore. I'm thinking of running every other day. Wish me luck! there will be a run for cause from Bonifacio Global City to Makati Central Business District. online registration for this event is until TODAY only. you can register online at http://www.globe.com.ph/runforhome. i will be up for the 21k race. hope i will be seeing you there!